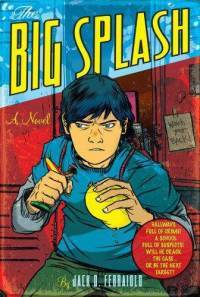 The Big Splash is the first novel by Jack D Ferraiolo, who has worked for over a decade in television animation and created and writes for the PBS show WordGirl, for which he received an Emmy nomination. 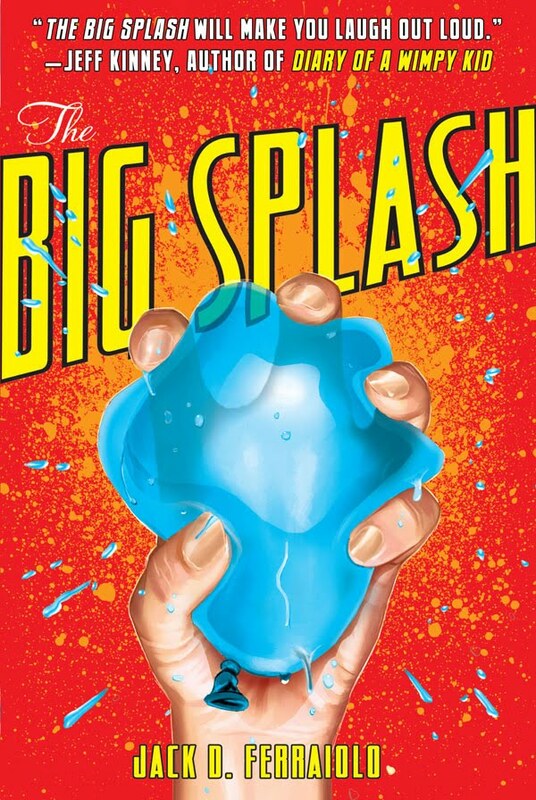 Published in 2008, The Big Splash came out in paperback a few months ago. Both covers caught my eye, but I have to be completely honest, books set in middle school with boys as the main character and/or narrator are my least favorite. However, when I do read them I always really enjoy them. Donna Gephart's How to Survive Middle School, with a main character who has his own Jon Stewart type show on YouTube, is the perfect example of this conundrum. So what was the tipping point for me? What convinced me that I needed to read the books of Mr Jack D Ferraiolo? His author video/book trailer, which can be seen by scrolling to the bottom of this review. This guy is HILARIOUS! Like a Stephen Colbert for kids - but adults will enjoy him, too. Ferraiolo's homemade video, utilizing his kids' toys which, when combined in the right way make a time machine, made me laugh out loud. His facial expressions and willingness to look like a fool were brilliant also. If this guy can come across this funny in his own video, then I had no doubt he could write funny as well. And I was right! The Big Splash is funny, witty and a clever parody of a noir thriller, but it is also extremely well written , character driven and thoughtful. I was so wrapped up in the lives of the characters, narrator Matt Stevens and his mom, especially, that I ended up tearing through this book - when I wasn't stopping to re-read passages of wonderful writing. As the flap reads, "Someone took down Nikki Fingers, the most feared squirt-gun assassin at Franklin Middle School! Matt Stevens is on the case!" The Frank, as the characters refer to Franklin Middle School, is packed with the usual suspects. Mr Biggs, aka Vinny Biggio, is a pudgy seventh grader who was bullied as a sixth grader but found a way to take out his tormentors and start up a business that involves trafficking candy, forged hall passes, loan sharking and more. Behind the shield of his body guards and a skilled assassin, Vinny runs the school and keeps kids in line with the threat of being put in "the Outs." Ferraiolo's kid friendly version of a hit is brilliant, especially for its believability in terms of social and emotional impact. Vinny's first victim is taken out when, during lunch in the cafeteria, the innocent little redhead (Nicole Finnegan, soon to be Nikki Fingers) sitting next to him slowly squeezes the contents of her juice box into his lap as he eats. When he stands up to leave another well placed employee of Vinny's yells out - for the whole school to hear - "HE PEED HIS PANTS!! PEE-PEE PANTS!" Whether the kids believe the guy actually wet his pants or not, the event is enough to guarantee permanent shunning by all. Kids put in the Outs are often never seen again, transferring to other schools or worse. However, by the end of sixth grade Nikki is done with her life of crime and retires. She returns to school for seventh grade a changed woman, her little sister Jenny, an incoming sixth grader, in tow. She is meek and plain, where she used to be "dressed in black, her wild red hair flowing behind her. She was fast, sly, and gorgeous. . . When she walked through the halls, crowds parted, kids three times her size scrambling to get out of her way. Vinny was the boss, but it was Nikki you feared, knowing it would be her face you saw right before your life took a turn for the worse. She had it all: the money, the notoriety, the power." When Nikki Fingers is hit, both Vinny and Nikki's sister hire Matt Stevens, seventh grade detective, to find out who made the hit. little place where kids could grab a sandwich and a soda, without the hassles kids face in grown-up establishments. It was just an old too shed, but Sal and his dad spent one summer putting in a bar and some tables. They made it look nice, not too showy, just a simple place where kids could unwind after a long day. The menu was pretty limited: either a peanut butter and jelly sandwich (strawberry or grape) or a toasted cheese, washed down with either a root beer or a cream soda (the good kind in the glass bottles). Two sandwiches and a drink would run you just three bucks. Not bad on a kid's salary. Although the scenes in Sal's are few, Ferraiolo does a great job bringing it and the kids who haunt it to life. Then there is the frequent, but not (as I thought it might be) distracting similes sprinkled throughout the novel. A bully is all over his prey "like hair on an old man's ear." Of an irate mother, Matt says she slammed the door "hard enough to rattle the two baby teeth I had left." To a suspect trying to sweet talk him Matt says, "Sorry, kid, that might have worked on Tuesday, but I'm a little older now and a lot wiser." And, while Ferraiolo's similes and noir-speak are very funny, the thoughtful observations of his characters are worth noting. Of his basement office, Matt says, "I furnished the place with rich people's junk - stuff that was perfectly fine, but sent to the curb by someone who had enough money to get sick of it." Obesrving Jenny's ponytail Matt says, it "flipped playfully behind her. It was an impressive and fluid motion, one that made you want to hang around her just so you'd have a chance to see it again." Of boys and girls in elementary school (called "Ellie" by the kids) Mac, the newspaper editor says, "the dating scene in Ellie is totally different than here, right? 'Going out' meant you might hold hands on the playground. Pff. Big deal. It didn't mean anything then . . . not like it does now." The kids sometimes speak with a seriousness that might sound silly and overly dramatic to us adults and, in the context of the story can even be read as part of the humorous imitation of an adult genre, but I think that kids who really are in middle school reading this book will appreciate the seriousness with which their lives are being addressed and portrayed. And, I say this as the mother of a thirteen year old son who is in seventh grade. I thought of him often as I read this book, especially when I felt like the characters were saying and doing things beyond their age. Then I remembered conversations I had had with my son, his friends and classmates and felt like Ferraiolo was spot on. About girls, Matt says, "You finally figure out how you feel about one of them, and then you have to figure out how they feel about you. Couldn't girls just send out a signal or something? Maybe they could have an "I like you" stick that they hit you with, or a big neon sign they could place over their heads that tells you "yes" or "no." All I know is there has to be a better system than the one we're stuck with." Being a noir-ish novel, there is some rough language. A sparse sprinkling of "damn" and "hell" can be found among the dialog. And, as to be expected, there are a few fist fights in addition to the squirt gun action. A couple of bad boys are even given the "dirty diaper" treatment. They are taken out behind the school, stripped to their socks and returned to their classmates in an oversized diaper soiled on both front and back, the height of humiliation and shame. One character, Joey, is even pummeled by kids playing kickball at PE when he is dumped on the playing field after getting the dirty diaper treatment. Of the brutish behavior of Vinny Biggs' crew as well as the general middle school population, Matt says, "He had been a rat, and a jerk, and he had put a bunch of kids in the Outs, but I still felt horrible for him. Nobody deserved what he had just gone through. Nobody. I had the sudden urge to grab each laughing kid and wet the front of their pants, just to see how they liked it - to see if they'd still think it was funny." 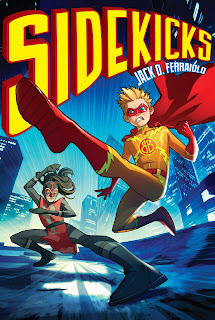 Until then, check out Mr Ferraiolo's excellent video, The Author's Mind's Eye #1, read The Big Splash and his my review of Jack's second book, SIDEKICKS! Then read the sequel to The Big Splash - The Quick Fix! (review to follow).